Sunday, February 18 was unusually warm for mid-February: above 3°C for much of the afternoon, a mild temperature considering this is typically the coldest part of the year. I went to High Park for a long walk. 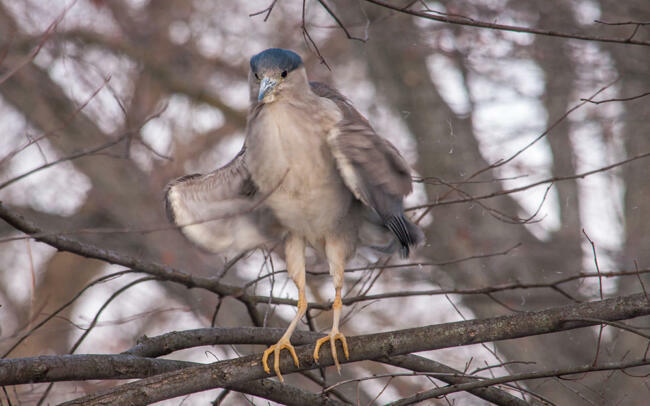 As I passed the cluster of cherry trees beside Spring Creek across the Children's Playground, a fellow who walked his dog asked if I had pictures of a Night Heron on a tree when he saw a telephoto lens on my camera. I didn't know that there was a Black-Crowned Night Heron in the neighbourhood. The fellow kindly pointed out where the heron was. 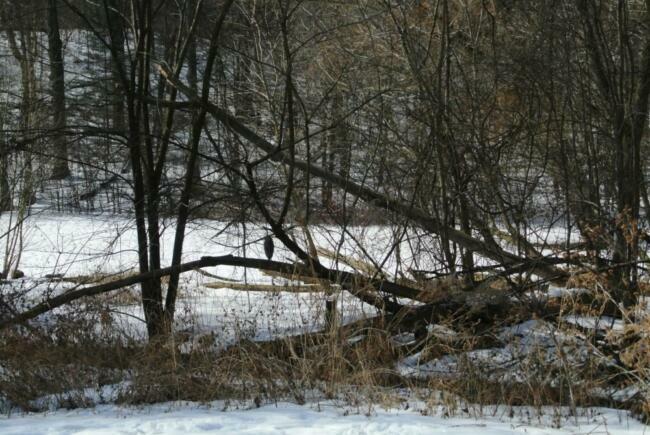 The bird was standing on a fallen trunk over the creek. To get a front view of the heron I walked around to the other side of the creek. I came to perhaps 20 meters from the bird. As I didn't know where the edge of the creek was, I didn't want to move even closer to risk falling in the frigid water. The heron was asleep. The sound of the crunching ice-snow mix under my feet woke them up. The bird did a bit of preening and fluffed their feathers. "Where is the "DO NOT DISTURB" sign?" ...and went back to snooze eventually. Seeing the Night Heron surprised me! There is not much food that the bird can find at this time of the year in southern Ontario, as their diet consists primarily of aquatic animals. 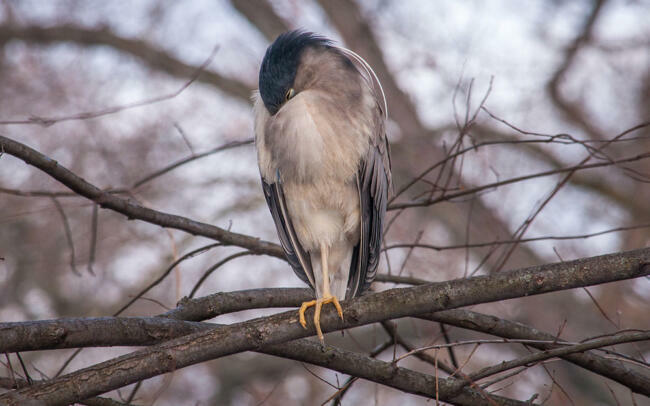 It is possible that this Night Heron is an early return from its migration south. However, it also may not have left the park at all. 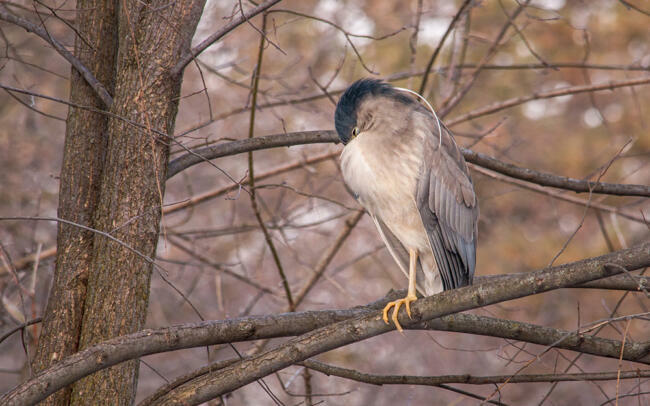 In early January a birder in Ottawa rescued a very cold Night Heron. Weather this winter has been wild, with much of December being relatively warm until Boxing Day when temperature nosedived to an unusually early and almost two-week long deep freeze. Since that episode, temperatures have gone through a roller coaster rise and dip with another two rounds of short duration deep freeze. After this unexpected sighting in the park I met Irena and David Allen for coffee. 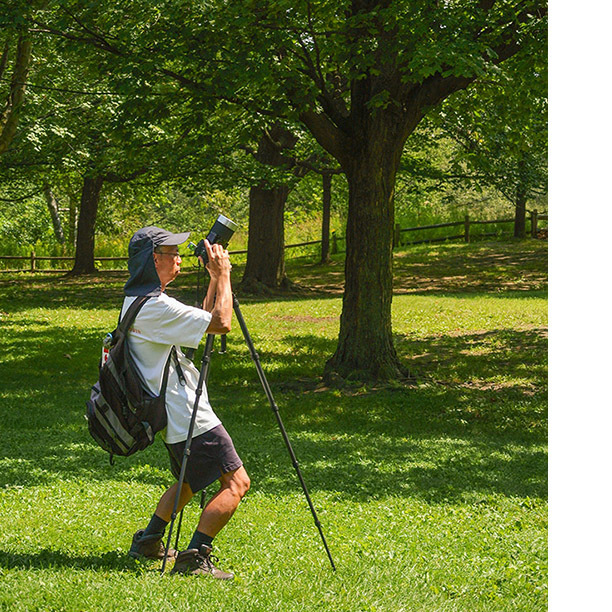 David is a professional photographer who conducts a photography hike in High Park on two Sundays every year (once in Spring and another walk in Autumn). 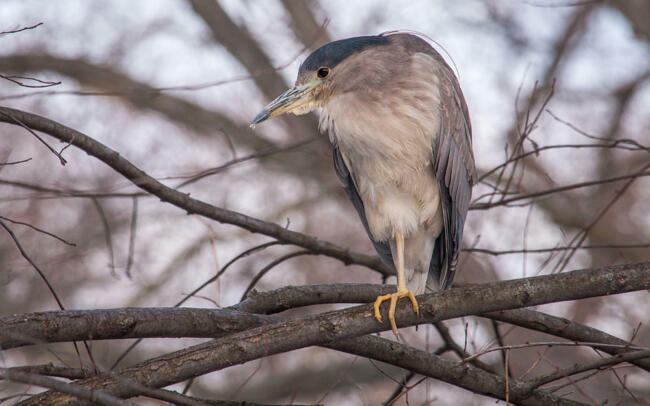 Irena and I talked about the Night Heron sighting, so David asked to see our photos (the same ones in this post). He commented that I missed capturing a picture of the heron showing both legs. Good point, but in the 20 minutes that I watched and photographed the heron, it stood on one leg just about the whole time, except the moment of grooming. As soon as the heron finished tidying up, it retracted the same leg again. 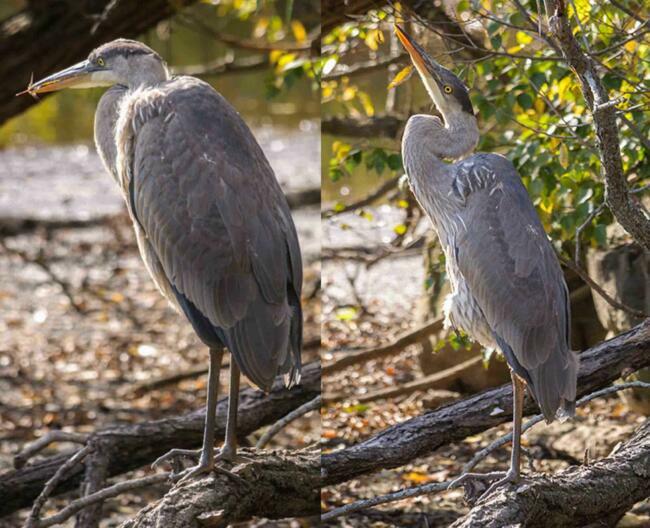 A Great Blue Heron at Upper Duck Pond near the Children's Playground in High Park. One moment the heron stands on both legs. Another moment the bird decides to tuck away a leg. Note in the left image that the heron catches a dragonfly as a snack. A bird that is well-known to do a one-legged stand is the flamingo. A decade ago Dr. Matthew Anderson, a behavioural psychologist at Saint Joseph’s University in Philadelphia, and his students looked into the one-legged stand phenomenon. Their subject was a flock of Caribbean flamingos in Philadelphia Zoo. The team concluded that flamingos stand on one leg to minimize heat loss from the bare legs. However, a study published in 2010 based on observations of birds in New Zealand contradicted the conclusion that Dr. Anderson and his team made. The New Zealand study suggests that the behaviour might be related to the shutdown of one half of the brain during sleep, when a natural reflex triggers a bird to fold up one leg. Other scientists have argued that the one-leg posture is mainly to reduce muscle fatigue. Professor Young-Hui Chang (Georgia Institute of Technology School of Biological Sciences) reasoned in a paper published last year that the unique and specialized anatomy of flamingos would allow the bird to stand on one leg and achieve balance without activating muscles, thus reducing muscular effort. While it might look strange to see a bird in an unipedal posture (i.e. standing on one leg), it is an amazing feat that the bird can maintain such a position for a long time! If you really want more technical details, see this extensive discussion from Dr. Reinhold Necker, an expert on avian sensory system. Andrew Yee - An astronomer who has turned his eyes from celestial gazing to observe terrestrial objects in High Park, and explore the natural environment. Sources are listed below and also linked throughout the blog post. All photos are credited to Andrew Yee unless otherwise specified.